Today's downloadable content additions for DC Comics fighting title Injustice: Gods Among Us add a familiar face to the roster and gifts extant fighters with a host of new aesthetic options. Developer NetherRealm Studios has done fantastic work in delivering interesting downloadable additions to Injustice: Gods Among Us. From Lobo to the Killing Joke skin pack, all of the DLC released so far has been a treat for comic book fans and fighting game fans alike. Today's crop of new content however, is the most exciting to date. 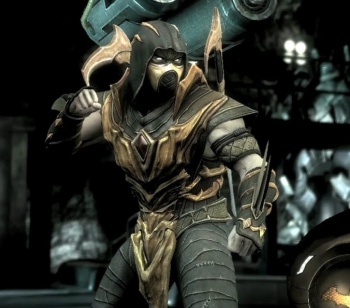 As we reported yesterday, NetherRealm revealed that the latest addition to the Injustice cast would be none other than Scorpion, the fan-favorite yellow ninja who's been incinerating his opponents in the Mortal Kombat franchise since 1992. His presence is today's biggest addition to Injustice, and downloading the palette-swapped kombatant will set you back $5. Of course, those of you who sprung for the game's $15 season pass will be able to download Scorpion gratis, along with whichever fighter NetherRealm opts to fill the pass' fourth roster slot. If the Scorpion DLC trailer is any indicator, this spot will most likely be filled by the Martian Manhunter. In addition to Scorpion though, there are three new costume options being added to the game today. First is the gratis costume included with Injustice's third compatibility pack. These packs ensure that everyone playing the game online will be using the same version of the game, and they are thus crucial. To guarantee that everyone rushes to download the compatibility pack, NetherRealm has been launching each pack alongside a new, exclusive costume. In this case, it's Doomsday's "Containment Suit," an outfit that should be familiar to anyone who read the Death of Superman storyline in the 90s. More traditional costume packs are also available, in the form of the Blackest Night Pack 1 and Red Son Pack 2. The former adds new looks for Superman, Doomsday and The Flash based on the 2009 DC Comics storyline of the same name. Quick version: Tons of heroes die, some come back as zombies, hence Superman looking a bit pale and emaciated. The Red Son Pack 2 is a followup to the previously release Red Son Pack that adds Soviet-themed costumes for Batman, Green Lantern and Deathstroke. As with the Blackest Night Pack 1, this costume collection will set you back $3. Unfortunately there's no special season pass-esque deal for grabbing these additional outfits en masse, but if it makes you feel any better, the aesthetic options included in these DLC packs are generally far more attractive and interesting than any given character's default Injustice costume. All of this DLC is now available for the Xbox 360 and PlayStation 3 versions of the game. DLC for the Wii U incarnation of Injustice is still slated to appear at some point during this summer, though if NetherRealm has a solid release date planned out they certainly aren't telling anyone about it. We'll bring you more details as they emerge.